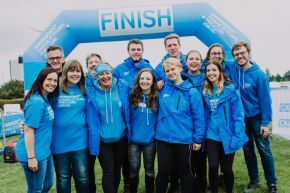 The Causeway Coast Challenge was the first major walk in Northern Ireland for Parkinson’s UK who have been making great impact both nationally and regionally. Parkinson’s UK is a charity that provides an essential support network for people with Parkinson’s and their families, it also raises vital funds towards research for a cure. “I was delighted to welcome the Causeway Challenge as it formed an important part of the 50th celebrations for the Coleraine Campus, highlighting Ulster as a Civic University while supporting the extremely valuable work undertaken by Parkinson’s UK. 120 people of all ages took part in the event which was designed to both raise money for Parkinson’s UK and to raise awareness of the disease in Northern Ireland. Participants chose to walk or run 26, 18 or 12 miles and took in the beautiful sights of the North Atlantic Coast. We would like to extend a massive thank you for those who took part and to the volunteers on the day. The money raised from the day will go towards high-quality care services and make a positive difference to the lives of people with Parkinson’s and their families. The event team at Parkinson’s UK were delighted at the support they received, and we hope to welcome them to our campus in 2019.